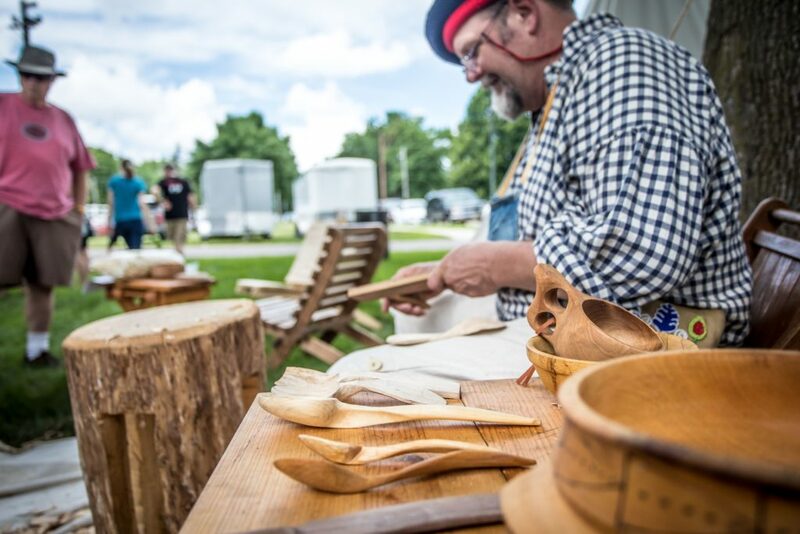 Visit Owatonna in July and you can experience living history! Check out our Calendar of Events for this year’s Extravaganza dates. 7 AM – 1 PM: Make your way to Owatonna in time to shop the Farmers’ Market in Historic Downtown’s Central Park. Vendors line the ‘town square’ displaying beautiful hand-made items, homemade foods & fresh produce. 11 AM: Cross the street and discover historic downtown in the National Farmers’ Bank, designed by world-renowned architect Louis Sullivan. The bank building is famous for its what would come to be known as Prairie School architecture. Take a closer look at the historic downtown, homes, churches and schools with a self-guided walking tour. Pick-up a Historic Walking Tour brochure at the Owatonna Chamber of Commerce and Tourism or select downtown businesses. 12:30 PM: Relax and enjoy lunch downtown surrounded by historic buildings. Historic Downtown offers a variety restaurants, coffee shops, and boutique shopping. Stop by Costas’ Candies & Restaurant or Curly Girlz Candy to pick up dessert! 2:30 PM: Tour the Minnesota State Public School Orphanage Museum and learn the story of Minnesota’s orphans. Between 1886-1945, 10,635 orphans passed through the only State School Orphanage in the country. Take a guided tour, watch videos and hear stories as told by those who lived at the orphanage. 5:30 PM: Enjoy an evening of cowboy fare and entertainment during the Chuck Wagon Supper at the Steele County History Center, the kickoff to the Steele County Historical Society’s Annual Extravaganza with old fashioned family fun! 8 PM: Relax and enjoy the rest of the evening with coffee and pie at Kernel Restaurant or a specialty martini at Torey’s Restaurant & Bar. Hospitality and a good night sleep await you back at your hotel. 9 AM: Rise and shine and discover Owatonna’s Parks and Trails with a brisk walk through Kaplan’s Wood’s or enjoy the sights and sounds of Lake Kohlmeier. 11 AM – 5 PM: Visit the Steele County Historical Society at the Village of Yesteryear for Extravaganza! Meet Straight River Sal and Rough Rider Teddy Roosevelt. Enjoy music, food, historic demonstrations, a vintage baseball game, an antique tractor show and more. All Village buildings are open to enjoy. Free admission, donations are appreciated. Events and times are subject to change. Contact the Owatonna Chamber of Commerce and Tourism for up to date details. For more itineraries and activities in Owatonna, contact the Tourism Department 800-423-6466.